My Friday favourite this week has to go to yet another new red item in my wardrobe (predictable, me?!) – this New Look ‘Funday’ jumper. 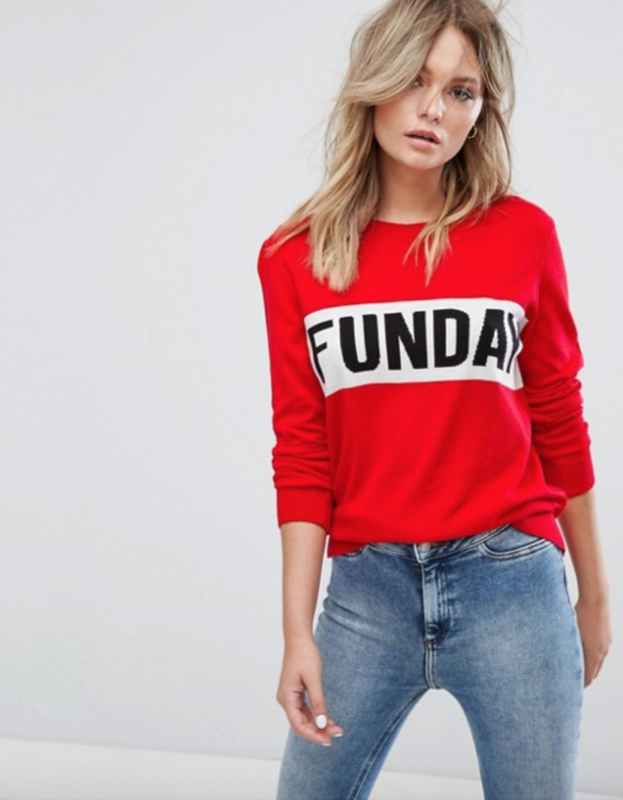 I’m not usually a fan of puns such as ‘funday’ or ‘Friyay’ but was willing to let it slide for this jumper after seeing it on a whole host of influencers and quickly falling in love with the design (plus, my hair covers the F, so it could easily be ‘Sunday’)! It was in and out of stock online so it took a lot of page refreshing before I finally tracked it down but it was so worth it – it looks great with a simple pair of black jeans and ankle boots, with a mini skirt or dressed down with light jeans and trainers. A bit of an all-rounder really. Typically, after weeks of refreshing, I went in to the New Look in the Manchester Arndale Centre the day after it arrived and they had piles of them, so although it’s currently sold out online, definitely check your local store and ASOS – with a bit of persistence, I’m sure you’ll be able to join the masses in sporting this soon-to-be everywhere style. I’ve been struggling to get a good night’s sleep recently, so when I read the rave reviews about Lush’s Sleepy moisturising lotion I knew I had to give it a try. It’s been touted as a miracle cure by both press and friends that have recommended it, so while I was set to keep my expectations realistic, I snapped it up pretty much immediately. A mix of oatmeal, lavender, tonka bean and cocoa butter, the lotion smells heavenly and even if it doesn’t send you straight to sleep, it’s a blissful nighttime treat for your skin. The Lush store staff advised me to apply it to my neck, chest and arms just before bed, which I’ve been doing religiously, and I have seen a difference in how easily I drift off, and the quality of my sleep.